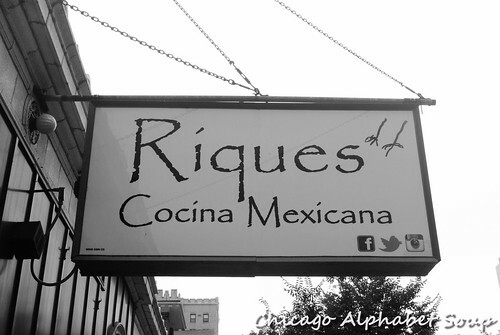 Up until the 90’s, Chicago’s go-to neighbourhoods for restaurant life were in the neighbourhoods that bordered Lake Michigan north of downtown. By the mid-90’s there was a new stretch of go-to neighbourhoods along Milwaukee Avenue and the Blue Line elevated train. 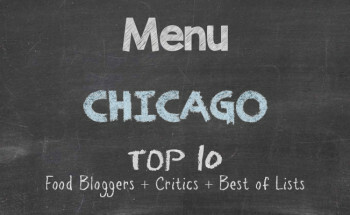 Gold Coast, Lincoln Park, Lakeview, Uptown, Andersonville, and Edgewater now have competition. 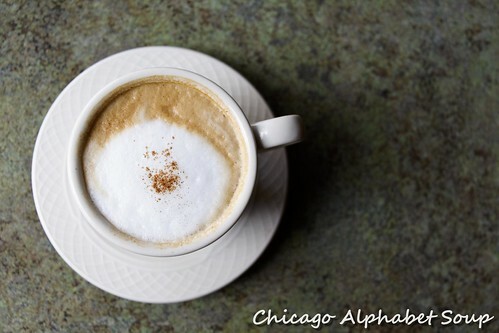 West Town, Ukrainian Village, Wicker Park, and Bucktown started gaining popularity, as swanky boutiques, independent coffeehouses, intimate restaurants, and nice housing filled the landscape. And none of the restaurants and shops were disappointing. 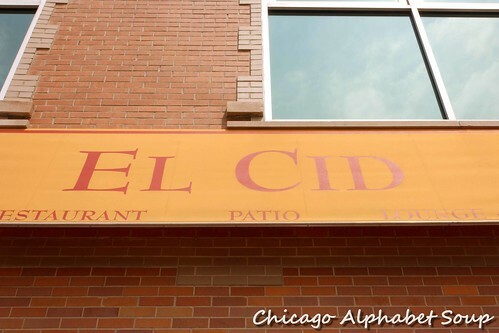 For example, there is Rio’s D’Sudamerica at 2010 W. Armitage Avenue in Bucktown neighbourhood, where you can have some of the best, authentic Peruvian cuisine in the city. 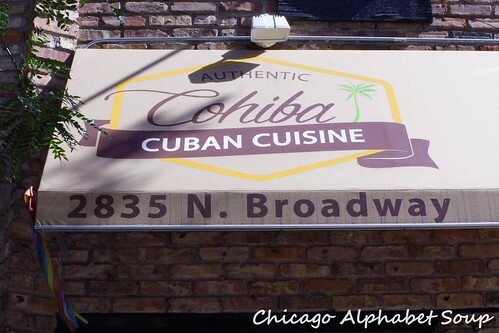 A short trip from the now-popular Logan Square, I met a friend so that I could get an entry on Chicago Alphabet Soup for Peru. She started with a lemon drop martini and I started with a mojito. Compliments to the bartender for mixing drinks that weren’t watery or overpowering. To quote Goldilocks, “It was just right.” My friend had been to Rio’s D’Sudamerica before, so I accepted her recommendations. One that sounded rather pedestrian was papa a la huancaina. This is now my favourite potato salad. The creamy sauce made the dish a dream. 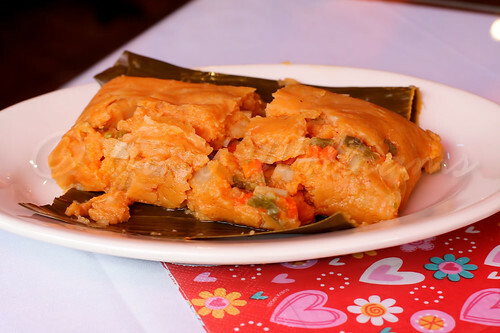 With us being seafood fanatics, we also ordered a dish of camarones en costra de quinua con pure de yuca-rocoto y salsa de maracuya. 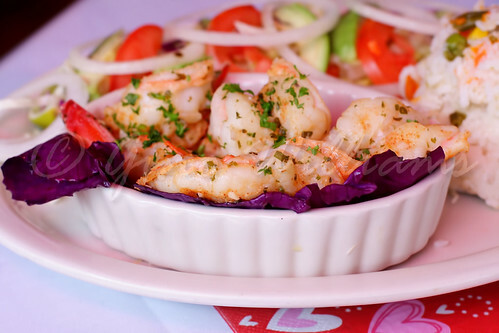 Four plump shrimp, encrusted in quinoa, were served over yucca seasoned with rocoto, olive oil, and lemon juice glazed with passion fruit sauce. Who in his or her right mind would want to awake from this dream? As if the appetizers weren’t divine enough, there was a platter of camarones a la plancha for an entrée. It would be hard to tire of eating sautéed shrimp that had been cooked in a red chili sauce and topped with a garlic and butter cream sauce. Served with white rice that actually had flavour, this was an entrée to enjoy slowly. 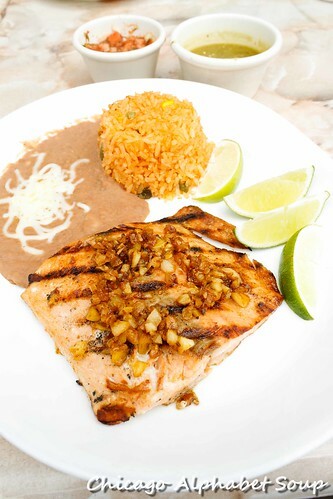 Although I have had camarones al la plancha before, this was the first time I was silent because it was so lip-smacking. 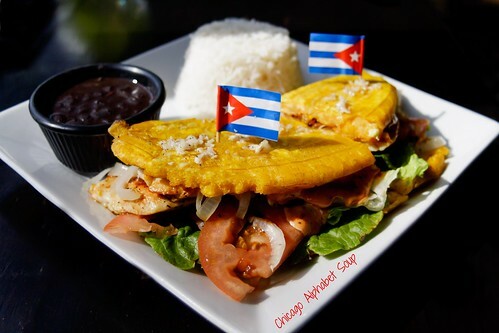 The dish that was new to me was the plate of arroz chuafa con camarones. I have had my share of Chinese fried rice and liked it. However, I am now in love with Peruvian fried rice and the shrimp that exploded in this rice dish that was sautéed with green onions, egg, ginger, and soy sauce was absolutely addictive. I am a fan. Because the appetizers and entrées were hearty, we sat for awhile and let our bellies settle before our final attack on some desserts. 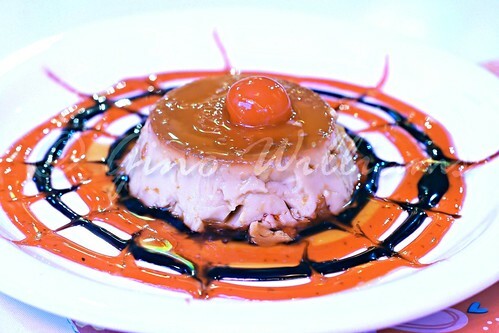 Light in texture, full of flavour, and heavy on the arteries, we had flan Peruano. 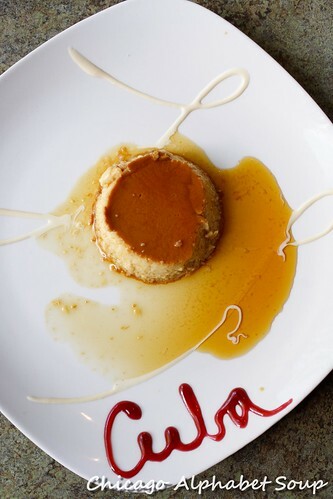 This was not a regular flan, for it was creamy. The texture was not like that of old Jell-O, but like slicing through a cloud. Not drowned in a caramel glaze, it wasn’t sugary, which made it that more enjoyable on the palate. 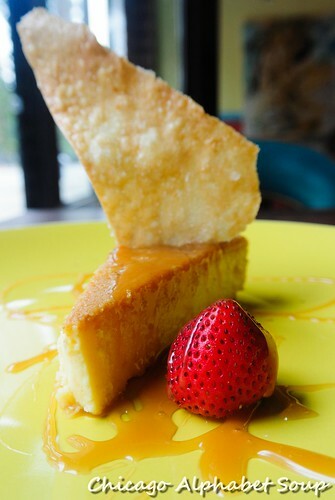 The dessert that could result in a continuous, long line outside of Rio’s D’Sudamerica is the lucuma temptation. 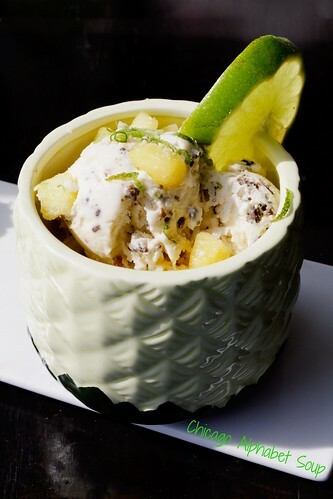 This ice cream, which is made from the lucuma fruit, yielded the flavour of dulce con leche. Had we not been sated, I would have ordered another dish of it. 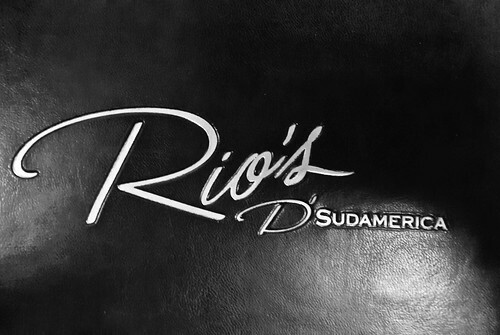 Rio’s D’Sudamerica has a large interior with plenty of seating. Because the food on the incredible scale is perhaps a 20 on a scale of 1 to 10, the restaurant fills up quickly. As always, I am a stickler for quality of food, service, and price. Rio’s D’Sudamerica blew me away on all three. 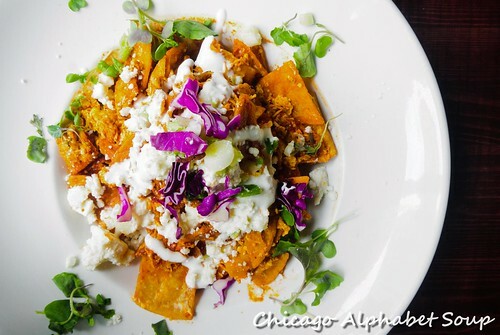 This is one of the reasons why Bucktown is one of the sought-after neighbourhoods in Chicago. It is definitely the main reason I have an entry on my calendar for a return in a few weeks. When you have lived in Chicago, Illinois, for eighteen years, there are a few things that you do not take for granted. The traffic is not easy on those of us who drive manual shift cars. You really do not need a car living in the city proper. People go on red and stop on green. The temperatures do not warm up until mid to late June, albeit there will be a few days of teasingly warm temperatures between February and May. It’s the latter that makes me hanker for being able to split my time between Chicago during the warmer months and Brazil during the rest of the year. I can dream, though. And I can also go to one of several Brazilian restaurants in the city when I need something to put me in the mind of being in a warmer climate like that of Brazil. And on a certain frosty evening after work, I met up with a friend in Chicago’s Lakeview at Brazilian Bowl at 3204 N. Broadway. Well, since I can’t get to Brazil the way I would like, the alternative is accepting the fact that a bit of Brazil has come to Chicago. Brazilian Bowl is a relatively small cafe that has a few high tables and a lot of character as far as the Lakeview scene goes. I had gone twice in 2012 shortly after the cafe had opened. They were still in the throes of finding their place. Many kinks had to be ironed out and with crowds pouring it, I am sure they were biting down really hard while having to entertain long lines of customers heaving exaggerated sighs. Much has settled since and it was time to return for another sampling of something traditional. For me, I ordered a Brazilian lemonade, a coxinha, and a feijoada. My friend ordered a steak bowl and a flan. Japanese do it well. Mongolians do it well. Koreans do it incredibly well. Now, it is apparent that Brazilians do it equally well. 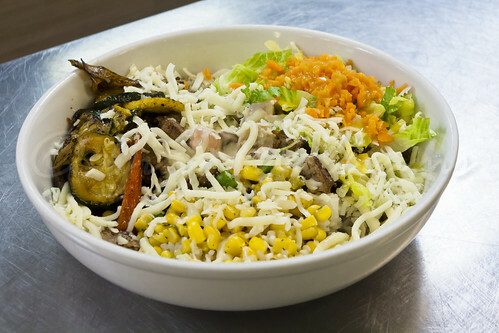 The steak bowl is not just some concoction thrown into a bowl as though someone is coming up with their own version of goulash. My friend had commented briefly that it was doing the trick and after seeing that he had polished the whole dish off with very little conversation, I was not going to argue with his assessment. Steak, corn, carrots, mushrooms, cheese, and rice joined forces to do their wicked bidding on his taste buds and he smiled. And I knew there certainly was no denying that the flan he had bought was worthy of the comment, “Oh, wow, ‘this’ is really, really good.” The steak bowl and the flan will be two items that I will have to be certain to add to my list when I return. 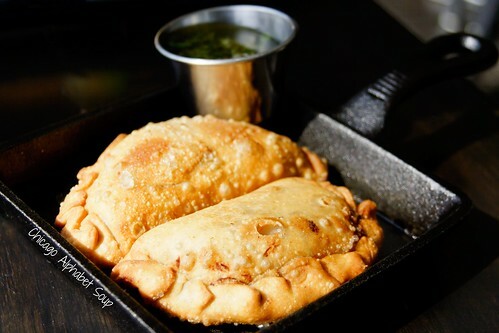 As for me, I had ordered two of the more well-known traditional dishes — coxinha and feijoada. 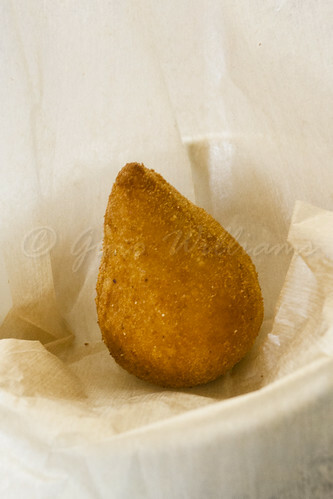 The coxinha was a huge tear drop pastry filled with chicken, corn, and some spices that went over very well. This falls more in line with street food, such that you can walk around with it and eat it from your hands, no utensils required. The feijoada was a bowl of rice, black beans, sausage, ham hocks, and greens mineira style was worthy. 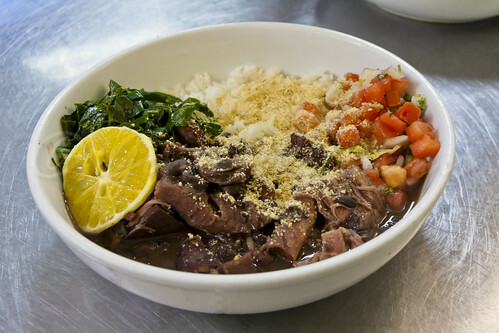 After a few scoops of the feijoada, it was quite clear that Brazilian Bowl is the second Brazilian cafe in Chicago to prepare the dish the way that I remember from my trip to Salvador Bahia. There was a lot more authenticity in the flavouring than what I have had in some small Brazilian cafes scattered throughout the United States. The Brazilian lemonade was, hands-down, the real thing. It’s not a failed attempt and fancy packaging. Only at Taste of Brasil have I had it authentically and now Brazilian Bowl matches the wow in the flavour exactly. The balance of tart and sweetness as well as the creamy consistency tell it all. 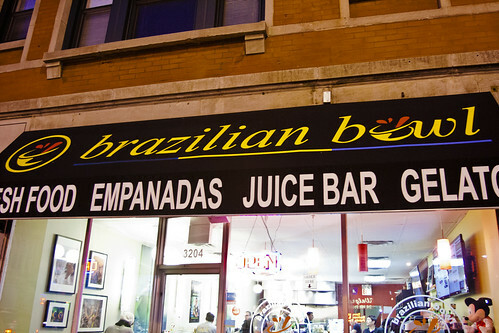 There are two other Brazilian restaurants in Chicago that I love to frequent — Taste of Brasil and Sabor Express. 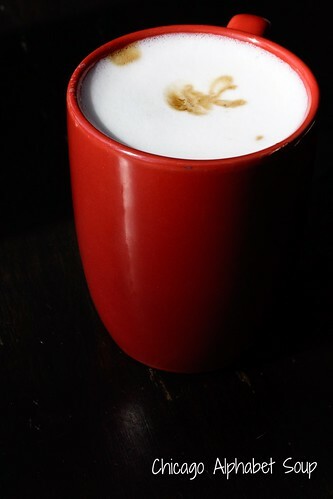 After the most recent visit to Brazilian Bowl and seeing that they have settled into a fantastic routine, I now can say that there is a third Brazilian cafe that I will frequent. I love the big box eateries like Fogo de Chão, Texas de Brazil, Sal y Carvao, Brazzaz, and the like, but there are times when you want something that puts you in the streets and along the beaches where the flavours reach out to you and tempt you to try what’s being prepared for your culinary delight. Hmm. Maybe sticking it out through the cold temperatures in Chicago isn’t so bad. Yes, I can dream of being in Brazil where it’s warm. 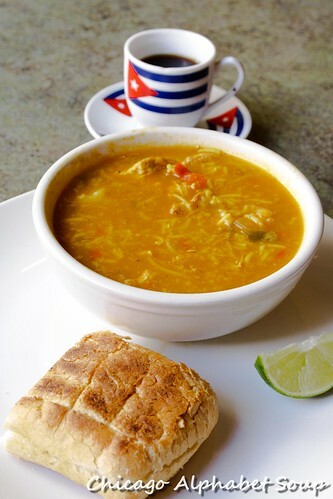 Some delicious food from Brazilian Bowl will help me have clearer visions when I do start to dream. Thanksgiving, 2012, came and went. There was food for all feasts. Cornbread dressing with brown gravy or cranberry sauce. Collard greens. Candied yams. Macaroni and cheese. String bean casserole. Cornish hens because there will be turkey for Christmas. 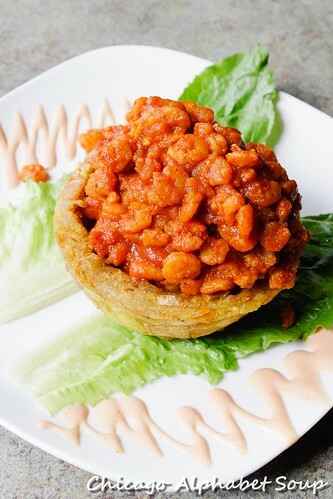 Sweet potato pies. Apple pie. Peach cobbler. Coconut pound cake. Almond scented white cake. There was, of course, a bit of weight gain after so much delighting. But it was not because of Thanksgiving gluttony. No, I had made a pact with my high school sweetheart that for every pound she took off, I would add a pound. Being such a diligent and honest man by holding up my end of the pony, the joints in my legs are now feeling the girth of 211 pounds. As if that was not enough, I returned from enjoying Thanksgiving with family with a calendar appointment for Fogo de Chão. And everyone’s eyes open wide with surprise. 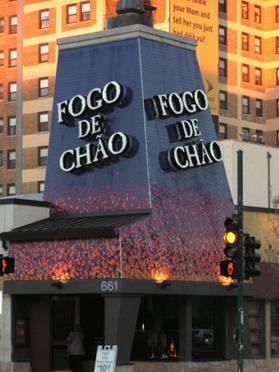 When I started Chicago Alphabet Soup many years ago, Fogo de Chão at 661 North La Salle Street was the second restaurant I went to. That was when I had a cheap point-and-click camera and before I started using my expensive digital camera properly. It was all about the food. Having then returned from São Paulo, Brazil, I wanted to see if the churrascaria in Chicago would make me miss the megalopolis. I remember the temperatures having a bit more bite than I had been accustomed to below the equator. So it was off to the best churrascaria in Chicago for their dandy bonanza of meat, meat, rare meat, medium rare meat, well-done meat, and then some more meat. Fast forward to 2012 and I have jumped willingly into the diet of a pescatarian. Why did I agree to meet up with friends at Fogo de Chão, of all places? Could it be that my high school sweetheart had told me that she had lost a few pounds and I needed to fulfill my end of the pact? Hmm. I will let that be my excuse. Much like the temperatures were during the first visit to Fogo de Chão, I wanted something to put me in the mind of being in São Paulo years ago. 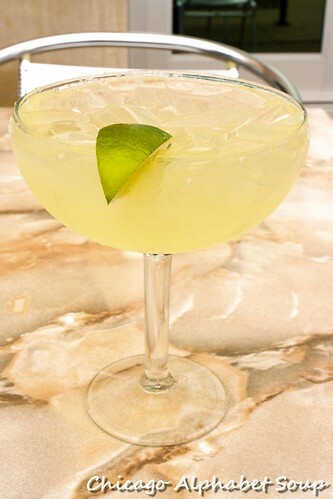 A glass of ciapirinha certainly would make that happen. Think of a mojito without the mint. I was quite happy, although I was aware of the sweater I had on, which meant I was aware of being in Chicago instead of in Brazil. Being a lightweight, I needed something to keep the alcohol from having me floating about the restaurant in my own little ether world. It was off to the salad bar. Asparagus. Mushrooms. Cheeses. Bread. Olives. Tuna salad. Chicken salad. Salmon. Smiles. 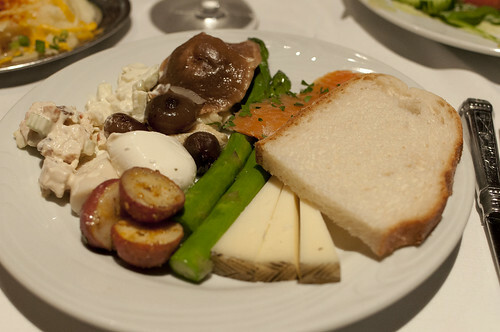 You are told to get a small plate of fruit and vegetables, not to fill up on the salad bar because the gauchos will keep your table occupied with various cuts of meats, rolls that melt on your tongue like cotton candy, mashed potatoes, and baked bananas. This could easily become any glutton’s nirvana. Then it was time to turn over the card for “sem,” yes, yes, Yes!!! The gauchos hovered through room with slabs of meat on skewers, of which you end up in a daze wanting everything that they bring. If I were a devout pescatarian, I would have stayed away. However, I have no willpower. That was rather evident when there was the mouth-watering aroma from lombo, which is parmesan crusted pork. There was also the essence of some beef ancho wafting up my nose. Imagine if you will Oliver saying, “Please, sir, I want some more.” This wonder meat had me wanting to launch into song, singing, “Food, glorious food, hot mustard and sausage.” Moist. Succulent. Tender. I am sure I could come up with about two dozen more adjectives to describe the flavours, six dozen if I were to describe the taste in several other languages. The picanha, the best part of the sirloin and flavoured with garlic, was worthy. I could have told the gaucho to leave a quarter of the slab at the table. Then others in the restaurant would have been screaming for my head on skewer, perhaps. This choice meat was just as tender as the previous selection. There appeared to be something of a glaze to it, as there was a slight sweetness to each bite. Imagine that. Other than at Argentinean steak houses, I have never had meat like this in it natural juices without the addition of sugar to the recipes. 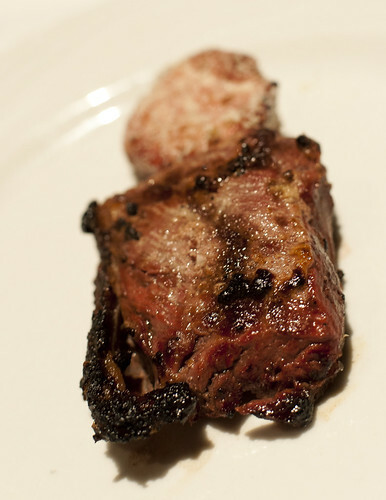 Fogo de Chão is the first restaurant to have succeeded in making the meat sing. 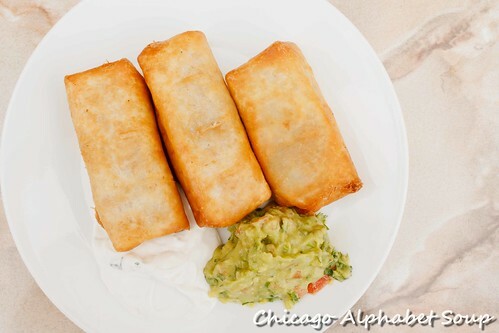 And I have been to all the popular churrascarias in America, Chicago boasting the majority of them. By the time a slice of fraldinha had made it to the table, the pescatarian angel and the vegetarian angel that were sitting on my shoulders had smacked their foreheads and declared defeat of saving my belly from the evils of meat. When I was a heavy carnivore, I wanted my meats to be well done. 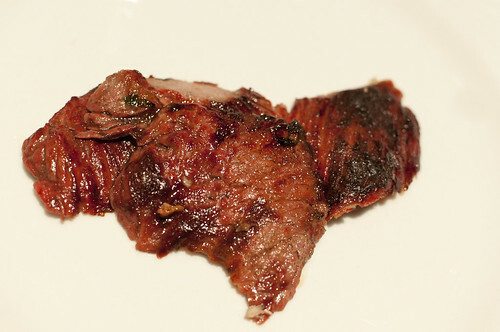 Well, I chose to have a medium well cut of the fraldinha. Needless to say, I enjoyed it. This is more popular in Southern Brazil, and I remember stuffing myself senselessly with some of it after a capoeira ceremony in Bahia. Yes, it was better that I had partaken of this after hand stands, backward flips, cartwheels, and round-houses. I would have split my pants or landed with a thump otherwise. But at Fogo de Chão I simply had to fan myself to stave off the sweat from working so hard on the constant cuts of meat, mashed potatoes, rolls, and baked bananas. In keeping with dining on beef primarily, I requested a cut of the alcatra. It was at this point that the previously mentioned angels were sparring behind my back. This is my favourite. 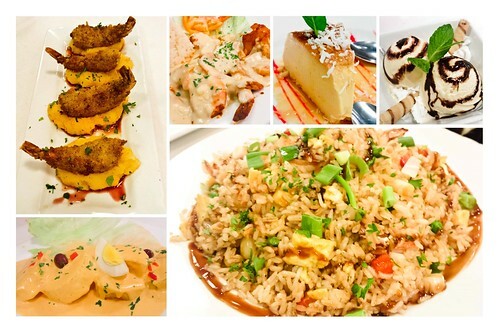 I have been to all the other churrascarias in the city — Texas de Brazil, Sal y Carvão, and Brazzaz — and whatever attempts they have made at alcatra seemed to fall into the okay category. There is no want for a cigarette afterwards. There’s no silence, which is an indication that the food is working magic on you. There is no Wow! 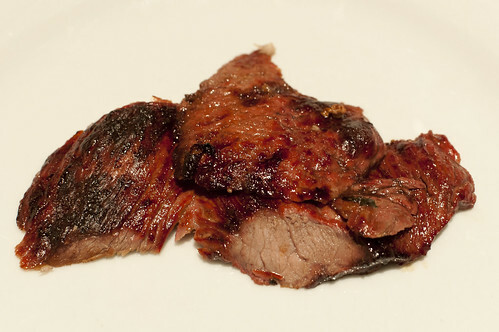 Much like me wanting the picanha all to myself, the alcatra invokes that same sensation. Rounding out my choices of meats was a cut of filet mignon. 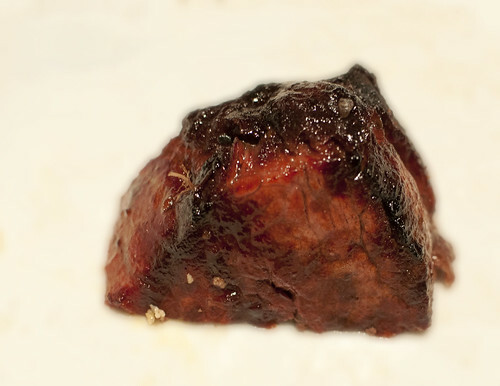 Growing up, filet mignon was always presented as bacon wrapped around ground beef. Who thought that was a brilliant idea? For my Brazilian dining experience, I opted for a medium rare cut. Now, usually when I have ever asked for any meat to be medium rare, the cow was still protesting. My appetite would have a quick pace running far from the restaurant. 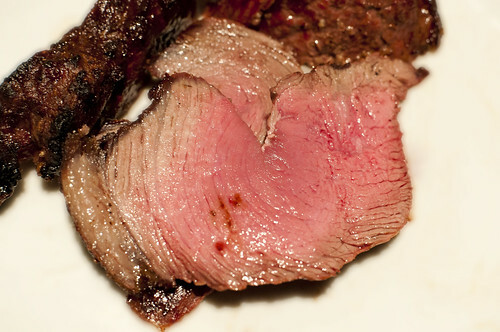 At Fogo de Chão the medium well cut of filet mignon was a tender piece of juicy meat that did not squirt or squirm. I worked my knife and fork on it like those actors in commercials who smile for the camera. But more than smiling, I actually ate the meat and I had no remorse, even for my pescatarian sensibilities. After about two hours of flipping the coaster back and forth over to alert the gauchos to bring meat and to stop bringing meat, it was time to stop the meat odyssey and polish the palate with some dessert. I have mentioned in past posts that I could put any cornfed Iowa Bart or Indiana Billy Joe Bob to shame at the dinner table and desert number one of three was a case study of that. 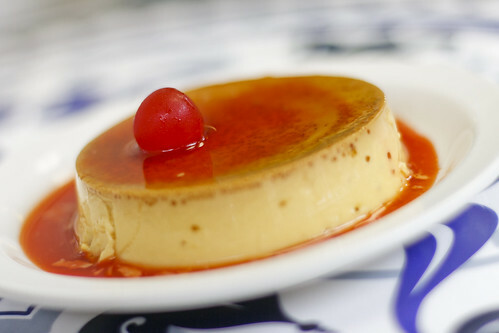 The flan was creamy like the flans I loved from Santo Domingo. 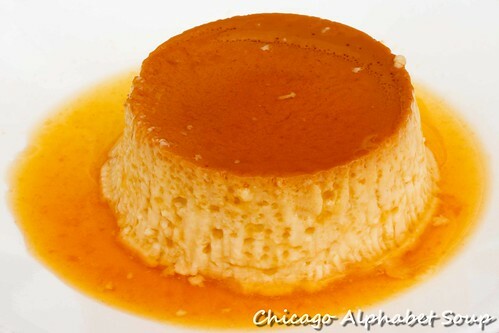 As much as I love flan, my blood pressure cannot say the same. But I am not a “yes” man to constantly working my teeth on the delectable dessert every time the option presents itself. Pause. 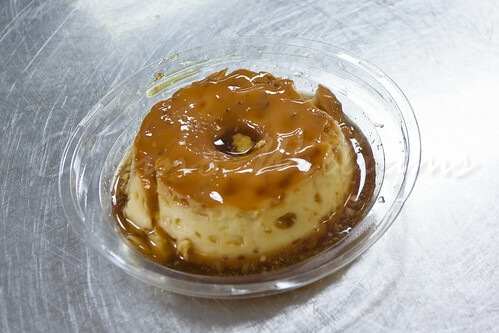 Okay, it’s most of the time that I concede to my want and gnash away on flan without complaint. 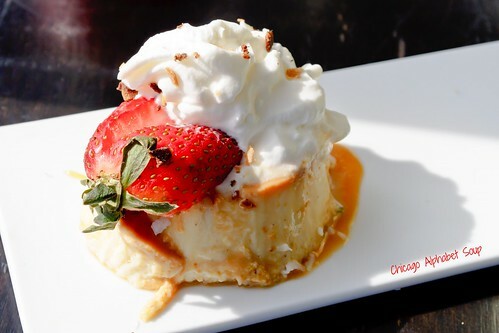 However, I shall not forget about the tres leches cake. Having had a slice of it from a restaurant a few months ago where I swear they poured a whole carton of milk on the cake, turned the carton upside down, and then hit the carton from the bottom to get the last drops out of it, the pastel de tres leches at Fogo de Chão had a texture not of drowned cake. 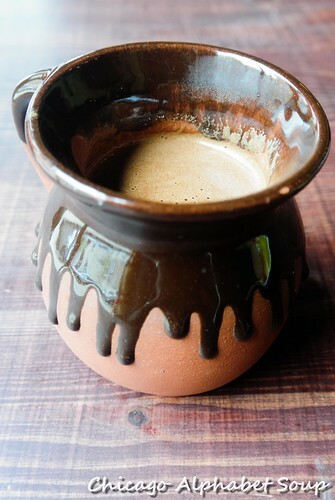 Enjoyed with some cafezinho, coffee, I can say with certainty that everything was okay in the land. To be honest, let me stop pulling your leg and just say that I was drunk from too much eating. Not one for turning into a jester, had I been at home, I would have danced, sang, and put on a performance. Food, glorious food. The award for most gluttonous eater of 2012 goes to, none other than, Gino Williams. The chocolate molten cake with a dollop of vanilla ice cream under a drizzle of chocolate was the coup de grace. Here is where we had Gino on the floor. 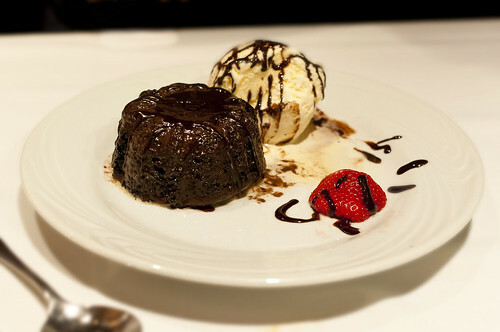 There is a restaurant in downtown Chicago called Grand Lux Cafe that has the best molten chocolate cake in the whole world. 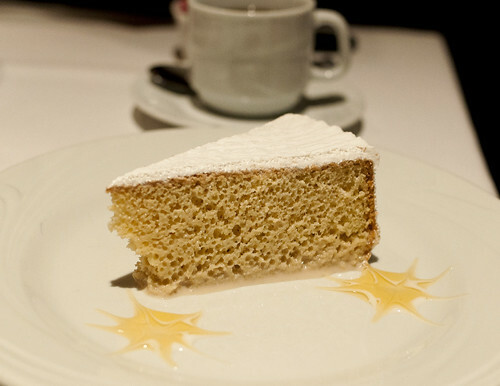 The cake at Fogo de Chão runs a very close second. I had been sitting for three hours filling my jaws and the act of standing was not an option. Having to move about was impossible. It was bad enough that I had to force myself to lean over so I could retrieve my wallet to pay the tab. But standing up and realizing that I was bent over like a geriatric was all anyone needed to see to know that I had shed my British polishing for being a thoroughly satisfied food brute. My running joke is that Fogo de Chão is indeed a lazy buffet, as all you have to do is sit while the gauchos tempt you with all the various choices of meats. There are the side dishes, but the whole churrascaria experience is worth the trip. 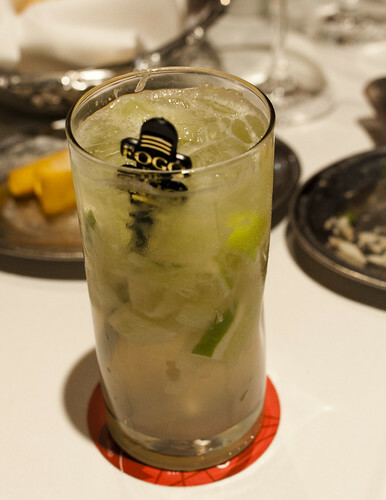 You may find other churrascarias in the city, but the one that you may find yourself frequenting is Fogo de Chão, hands down. One thing to note is that the price may grow a few grey hairs in your head, in your beard if you’re bald. 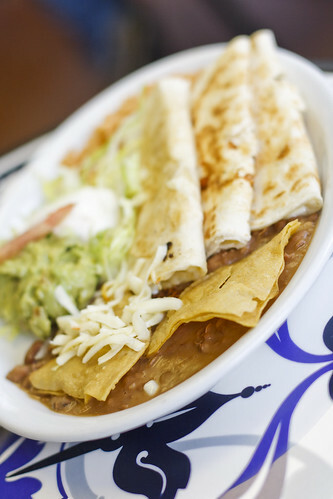 Go for lunch instead, when the prices are not as cha-ching as the dinner prices. But make sure it is during a half day at work because eating too much will result in a dire need to go to sleep afterwards. Another thing is that it would be a crime to go to the restaurant if you are not one for eating meat. The salad bar panders to the vegetarian and pescatarian palates wonderfully. Still, the constant view of meat would tempt even a staunch vegan. As for me, I think I gained enough weight to keep my word to my high school sweetheart. But that was not enough. She called and told me that she lost a few more pounds. Looks like I will be getting up to 220 pounds by the beginning of the New Year. My resolution will be to stop making pacts, but it won’t be to stop eating like a bottomless culinary fanatic. Another grey day in Chicago and I spent most of it inside watching the telly. Thank you, winter. A week had passed since I had gone out and put my feet under some table at one of many eateries in the city. Part of it was having to deal with a bloody cold. Nothing like having your lights and heat go out because someone hit a patch of black ice, smacked into a pole, and took out part of the electrical grid. A frosty apartment is a sure way of catching a cold and, in my case, a bad one. Having a little recovery, my appetite returned and I was a bit tired of cabin fever. So I said to myself, let the hunt for something to fill the belly begin. After looking through the list of entries for the alphabet soup, I figured that I would fill in a few ethnic restaurant entries that did not have a lot of alphabetic representation. The letter G was the first to blink on my radar. 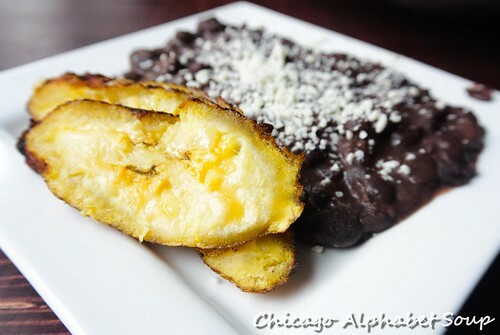 Because I could count on Chicago to have at least one letter, I consulted my magic ball — Google, to be honest — and saw a Guatemalan restaurant in one of the neighbourhoods not far from me. The weather outside had warmed up just a bit. I must admit that 35 degrees is fantastic compared to the temperatures bordering on zero degrees that we had been having. I layered up enough to stay warm, grabbed my camera, camera bag, and Kindle for reading, and I was off to have comida de Guatemala. 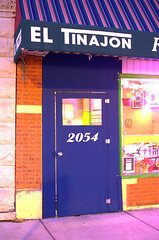 El Tinajon at 2054 W. Roscoe Street became my destination. 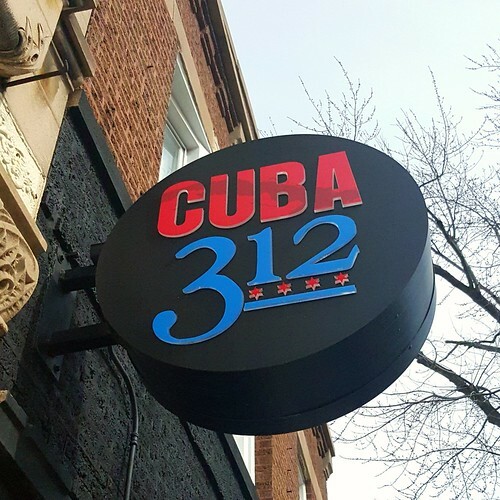 Located on the most active street in Roscoe Village is a gem that you could miss amid all the swanky boutiques and art chic-chic restaurants. Festive in colour and warm in spirit, it is a cute spot for a quick meal. From outside, everyone looked like they were having their fair share of communal fulfilment. When I entered, there was suddenly silence. Only when I said, solo yo, did conversation resume almost with a sigh in the air. Once everyone began talking again, I understood the exaggerated pause — everyone in the seating area spoke Spanish only. Well, that is common in Latin restaurants, but I do not look the part of someone who could be Latin, let alone speak Spanish. I sat by the window so that I could get a good number of photographs with natural light. 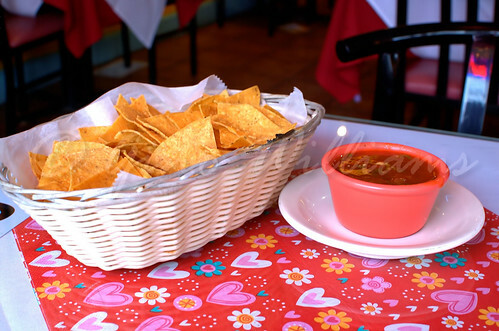 First to the table was a complementary basket of chips and salsa. The chips were nice and crunchy. 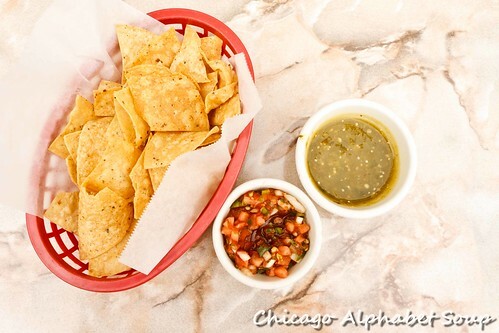 The salsa was a bit thin yet flavourful. 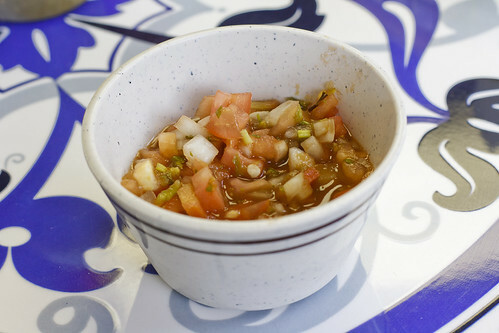 Not that I am a fan of all of my salsa being chunky, watery salsa tends to soften crunchy chips faster than expected. The server approached to take my order and I made my request in Spanish only. For an appetizer, I ordered plache de papas. This was a tamale with potatoes and vegetables. 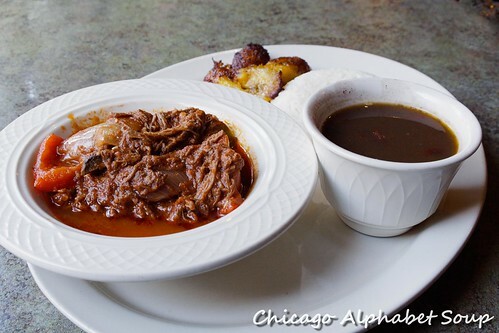 Apparently, you can also get plache de papas with meat — chicken or shredded beef. I opted for the vegetarian option and was glad that I did because this appetizer was delicious. My entrée was camarones al ajo. These shrimp were cut so that they were spread out like butterflies and it was quite clear to see that El Tinajon does not use the small nibble-size shrimp for this entrée. The things were plump and large. The shrimp was in a garlic sauce so reminiscent of scampi, albeit not excessive on the garlic. The rice with corn and peas in it had the texture of Asian sticky rice. This was not a bad thing, but rice prepared in most Latin dishes is fluffy. Needless to say, I ate it to completion. I washed it all down with a glass of tamarind juice. For those of you who have never had a tamarind or the juice, it could be a bit of an acquired taste. It is hard to describe the flavour, but there is a slight fermented kick that you get from some of it. 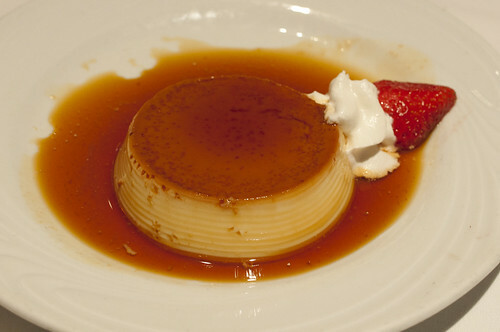 I completed the dining experience with a flan. Decorated so perfectly, it was clear that it had been yanked from the refrigerator, dolled with a caramel top, garnished with strawberry and chocolate glaze, and topped with a cherry. It was a bit cold to the bite still. When you have had smooth and even creamy flan, you almost find yourself wearing the tattoo of flan snob somewhere visible. If I should ever return, I may try a warm dessert. El Tinajon was a nice escape for the afternoon out of the apartment. There is a bit of charm to the place. The prices are incredibly reasonable. With the restaurant being on a street that has a tremendous amount of American pedestrian foot traffic, the food may pander to the American taste mostly. The discriminating palate knows. 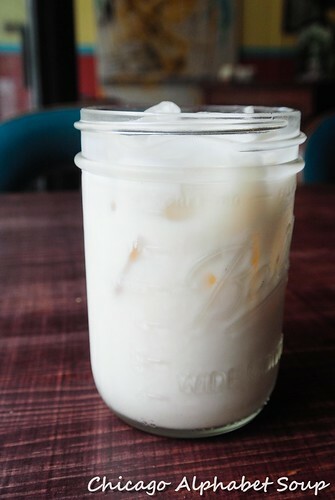 If you want something quick and still have enough dollars to fluff your wallet and a fair amount of change to jingle in your pocket thereafter, give El Tinajon a try. 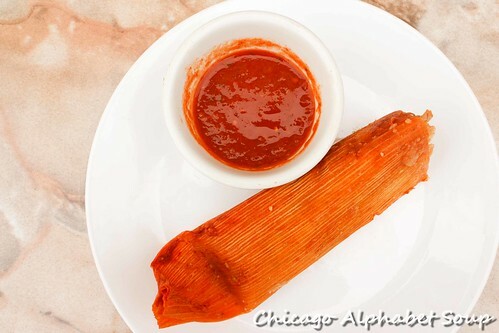 Chicago boasts a good number of Guatemalan restaurants, but El Tinajon is the only one that is not a fusion with some other Latin cuisine. And now for me to think of what ethnicity to seek next.